Due to unfortunate circumstances, the Draconic Awards will not be held at LVO. The hobby classes will be lead by Aaron Lovejoy from Miniatures Monthly and the LVO Organizers will be handling any other of the Hobby events. Sorry for the inconvience. 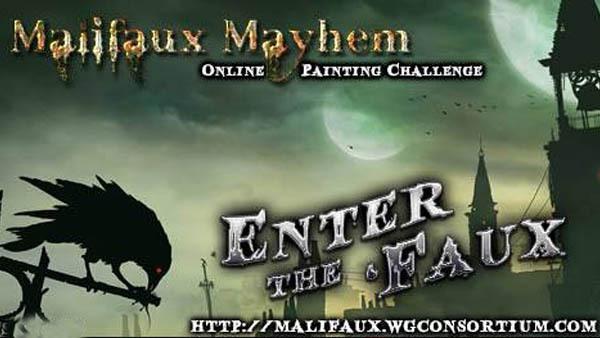 Our First Online Challenge Results are in for Malifaux Mayhem! People's Choice Awards for Kublacon! People's Choice Awards voting for Kublacon starts at 8pm pacific time tonight. Just go click MY PANEL to get started! We had a great time at Kingdom-Con. It's wrapping down now and the Draconic Awards Results are up! We also had great turn out to our classes this year. It looks to be an awesome next year as well! Join us next year!! Happy new year! We'll be organizing classes at LVO this year again. Originally we were going to forgo it because of space problems but it looks like the guys at LVO were able to pull it off. Register today! Just click here. LVO 2016 has been announced! Las Vegas Open has been announced and the Draconic Awards will be holding our Western Regional there again! Are you ready for Vegas? Tickets go on sale on Friday, August 27th. Purchase your tickets here. We had a great but tiring busy time at CaptainCon! We had 70 entries which makes it one of the biggest events for the Draconic Awards to date beating KublaCon at 64 entries! We like to thank the staff at CaptainCon for being gracious and very accommodating hosts and of course to all those that have entered the Draconic Awards! The east coast had truly showed up to represent. Will CaptainCon hold the record for the most submissions to our event of this year? Well, there's one more event for us and that's GearsCon. Will the Brits show us all up in the USA? We'll see! We hope to see you at GearsCon! Check out the CaptainCon results here. CaptainCon is litterally around the corner! Are you ready? We'll be taking submission on Saturday from 10am to 6pm. And yes, the People's Choice Awards are being ran again! Open voting for the PCA will start at 8pm Eastern Time. Remember, to vote, click on "MY PANEL" after 8pm and start voting! More information about CaptainCon here. BAO was heck of a fun time! We had a rocking time over at BAO. Wonderful entries and it was a great test run of the first use of the People's Choice Awards! There was some bugs on the ceremony powerpoint but we'll get that fixed! Check out the results here! You be the Judge! Draconic Awards introduces a new "People's Choice" awards! After this weekend, the backend will be open for those that want to tie in their entries in past shows they've entered. If you're one of them be sure to find those entriy slips! With this also comes the "People's Choice" awards for the Draconic Awards. YOU GET TO BE PART OF THE VOTING PROCESS! That's right. When we open the backend up, you can also use your WGC account to cast in your vote at each show the Draconic Awards will be held. This is basically how it works. At the event we will be taking entry submissions up to 6pm local time. 1/2 hour later, we open open up voting for the Draconic Awards People's Choice Award for around 6-9 hours. All entries are eligible for this and anyone who has a WGC member account and cast their votes. There will be three placement plagues for the People Choice Awards and we'll be launching this test run at Bay Area Open and CaptainCon a week after. More to come! Calfiaux was a great time for the Draconic Awards! This was a celebration of the Draconic Awards as Califaux is our mark of our very first inaugraul event! Thanks for those that have entered in to the competition. Next year will be the mark with opening the Master category and running it as a Extended Local event as we're pushing a bigger hobby presence there! The results are up. Check it out! The Draconic Awards at Kublacon has been a blast! What a fun weekend at Kublacon! What turned into a vacation turned in to work! But that's ok. Because of the experience we had to adjust some rules and streamlined the back end system a bit more. Wayne was an awesome guy to hang around with! The final tally for the competition is now up! Check it out! Kublacon has been added as a Host! 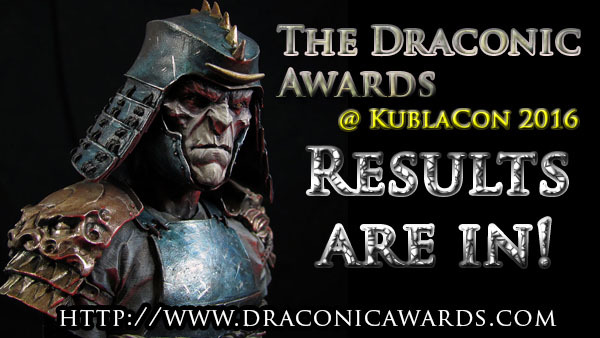 Kublacon has been added as a host of the Draconic Awards! The last event added to this years schedule, Kublacon is held in Northern California. If you're in the area, it's a definate event to check out! More informations here. Las Vegas Open was a Blast! We had a blast at LVO! It was a great turn out and we had loads of fun. We had some great entries and looking forward to next year. Check out the submitted entries for the painting competition and congrats to our winners! Also, check out more pictures of the event at our facebook page! Las Vegas Open is two weeks Away! We busy getting things set up for LVO in two weeks! Are you going to be there? Check out the rules for entering the awards as well as more information about our hobby events and classes! Check the event page here. Welcome to the New Draconic Awards Website! Welcome to the new website. We're still working on the back end so for those that have attended a past event and itching to claim your entries to your WGC account, you will be able to do that soon! Bare with use as we're busy getting things up and trying to get all the DA events organized for 2015! It's going to be a fun year!